A thief who targeted vulnerable shoppers in Huntingdon has been jailed for 16 months. Francis Maughan, 30, of no fixed abode, was given the sentence at Cambridge Crown Court yesterday (December 9) after stealing purses from two female victims. 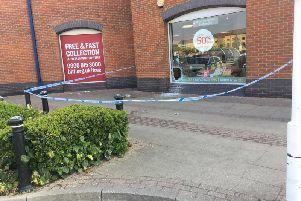 The first incident took place at Waitrose in Huntingdon on August 26 when Maughan took a purse, containing £60 cash and bank cards, from a woman’s handbag. On September 17 Maughan struck again in Sainsbury’s Huntingdon. He distracted the 91-year-old victim by talking to her and took her purse containing £50 cash and her PIN number. Maughan went on to withdraw £250 from nearby cash points before purchasing goods worth almost £500 from a sports store. Staff in the sports shop raised the alarm to police who pursued the offender on foot. Maughan led officers to his parked vehicle before making off again on foot. Police discovered cards belonging to the victims by the vehicle and were able to obtain Maughan’s finger prints to identify him. Maughan was charged with two counts of theft and one count of fraud by false representation. He was sentenced to 16 months imprisonment.